Rachel Von | The Journal Gazette The cutting of Tra-Deon Hollins raises questions about the role of a development league. Tra-Deon Hollins had proved to be one of the best guards in the G League – second in assists (8.4) and steals (2.6) per game – but he's now jobless. The Mad Ants released him Wednesday without explanation. Not until The Journal Gazette spoke with multiple sources did it become public knowledge – he'd failed multiple drug tests over two seasons – and his agent, Bill Neff, is questioning why the NBA, which operates the G League, and the Indiana Pacers, who own the Mad Ants, aren't trying to help players such as Hollins more. Neff is advocating for his client, whose reputation has taken a hit, but he brings up good points. The Mad Ants (18-16), who play host to league-best Santa Cruz (25-10) for today's bring-your-dog Hoops and Hounds 5 p.m. game at Memorial Coliseum, have declined to comment. So it's fair to say we don't know the whole story. Neff believes players should be helped through problems, even if they aren't being honest with their teams or themselves, and that there should be more support systems in a developmental league. One could argue the G League and the Mad Ants don't owe players such as Hollins anything. He was aware of the NBA's anti-drug program, which has voluntary ways for players to seek help, and even allows them to continue playing before they're suspended for multiple violations. Several G League teams have inquired about Hollins, who will have to serve a five-game suspension if he signs with one of them, Neff said Saturday. Other players in the G League who tested positive for drugs recently, including Stockton's Marcus Williams, Delaware's Norvel Pelle and Sioux Falls' Bubu Palo, were retained by their teams. If the release of Hollins, 23, signals a zero-tolerance policy in Fort Wayne, it better stick to it, even with Pacers prospects. Neff said Hollins isn't a habitual user, that he got caught early in his career and had learned his lesson. However, he said, Hollins was careless over the Christmas break and didn't think about the ramifications. That may be a poor excuse, but Neff's claim that there's hypocrisy and marijuana is a part of the NBA culture are truth. Former Pacers player Stephen Jackson recently admitted to smoking pot throughout his entire career, even before games. Again, neither Mad Ants general manager Brian Levy nor president Tim Bawmann would comment. What I can tell you is the last time a Mad Ants player got flagged for multiple drug violations, it was captain Chris Porter in 2015, that was with a harder drug, and it was the league that terminated his contract. 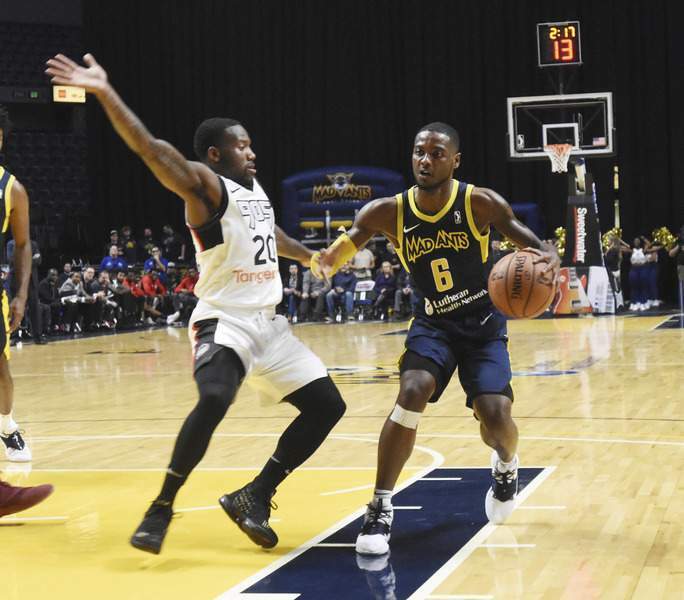 The Mad Ants' former ownership group pleaded then with the G League to find another solution because Porter had resurrected his career and become a community ambassador. Kicking him to curb seemed to serve no one. The Mad Ants could welcome players straight out of high school next season. They will need to develop and nurture youngsters who may have uncomfortable situations that include drugs, legal entanglements or just plain immaturity. How will they deal with those? Justin A. Cohn, senior writer for The Journal Gazette, has covered Fort Wayne sports since 1997. He can be reached by email at jcohn@jg.net or phone at 260-461-8429. You can also follow him on Twitter@sportsicohn.